This feature has been requested by our users and we are very happy to bring this live to you. Yes, you can now keep track of the money you owe someone else. 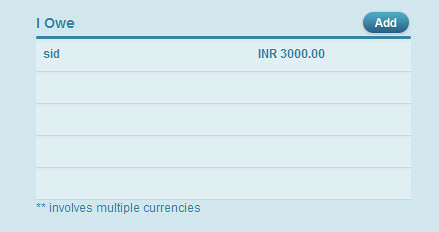 Just click on “Add” under your I owe block in your Track Every Coin account. 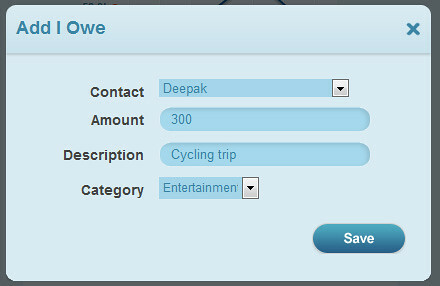 Select the person from your contact list, enter the amount, description and category and save it. This will get listed under your “I Owe” block. When you add an I owe yourself. When your contact adds an expense against you. Both this expense against a person will be added up and shown at once. This is also a new feature we have added. When you click on the tick mark of an I owe, you now have the option of adding it to your expense or just marking it as completed. When you add it to your expense, all the list of expenses that you owe someone will be added in your expense grid one by one. Take a case study of 2 roommates. When they share expenses against each other, expenses are shown in their respective I Owes. When they add it to their expense, the whole list is also added to their expense grid along with the categories. This helps you capture all your expenses! This is a great feature and will be definitely good example of listening to your users.